The true essence of yoga revolves around raising our vitality or awakening the 'Kundalini' near the spinal cord. It has to be achieved through a series of physical and mental exercises. At this physical level, various yoga mudras or 'asanas' are included in this method, whose main objective is to keep the body healthy. In mental technique, disciplining the mind involves breathing exercises or 'pranayama' and meditation or 'meditation'. The ultimate goal of yoga is to help the person to achieve the highest state of Enlightenment by lifting himself high. As stated in the Bhagavad Gita, "The person is engaged as a yogi by doing his own work, disciplining the mind completely and being independent of all desires, when he becomes absorbed in self only, then he is considered a yogi." Yoga is not a religion, it is an art of living whose aim is - a healthy mind in a healthy body. Human existence is physical, mental and spiritual, yoga helps in balanced development of these three. Other forms of physical exercise, such as aerobics, only ensure physical fitness. There is nothing in them for the development of spiritual or subtle body. By activating parasympathetic nervous system (parasympathetic nervous system), reduces stress and tension in the physical body. Yoga seekers again feel young and excited. Thus, yoga gives power to every seeker to control the body and mind. Art of practice of yoga helps in controlling the person's mind, body and soul. It achieves the calm body and mind of physical and mental balance. By managing stress and anxiety, you are relieved. It also helps in body flexibility, strengthening muscles and enhancing physical health. It improves respiration, energy and vitality. By practicing yoga, it seems that as if it is limited to stretching or stretching only the body, but as you see, feel and do the activity, more than that it enables your body to do it. Yoga postures create power, flexibility and self confidence. Regular practice of yoga can help reduce weight loss, relieve stress, improve immunity and maintain a healthy lifestyle. 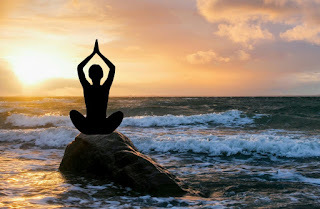 In 2014, India's Prime Minister Narendra Modi has suggested the United Nations to celebrate June 21 as International Yoga Day, because in the summer the Sun is located at the northern point, the northern hemisphere is the longest day of the year. "Yoga is an invaluable gift from the ancient tradition of India. This is a 5000-year-old tradition. It is a holistic view of the unity, thoughts and actions of mind and body, restraint and fulfillment, goodwill, health and well-being between man and nature. It's not just about exercise but to be one with yourself, the world and nature. By changing our lifestyle and developing consciousness, it can help in providing healthcare.